Buy: Chapters | Check your local bookstore! Will Ferguson is a Canadian author known for his books about his travels and about Canadians. I've enjoyed him since we first studied Why I Hate Canadians in grade 11 history. My favourite book by Ferguson is Hitching Rides With Buddha. The only other book I've read by him, aside from this one, is How to Be Canadian. Still have to read Beauty Tips from Moose Jaw and I'm sure I'll get around to his fiction one day...Anyhow. 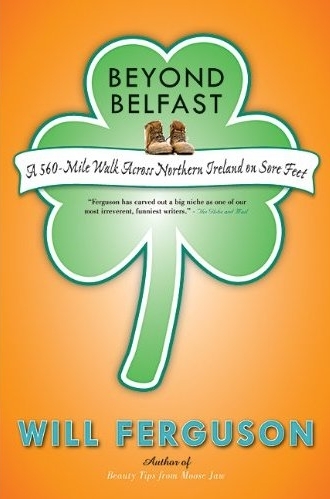 Beyond Belfast, the story of his ambitious undertaking to walk the Ulster Way (a 560 mile path around Northern Ireland) will be released in soft-cover just before my birthday and I will definitely be putting it on my wishlist. Ha! You didn't get me this time, you fokkers! The driver was eyeing me in his mirror. I had said that last part out loud. "The rain," I said by way of explanation. "It's been trying to get me." It was bloody friggin' marvellous, so it was. (A view like that brings out the poet in me). I thought about pensioners under siege on Park Road, about children burning, about off-duty police officers dragged from pubs and kicked to death, about the watery cries for "Revenge!" As I walked toward the shopping plazas in the city centre, I saw a McDonald's at one end, its golden arches catching the light- and I felt a sudden surge of relief. I walked toward the arches, rested my forehead on the cool condensation of its windows, the glass like ice on a fever. It was so comforting, the polished surface, the lack of memory, the lack of any larger context. I like the perspective of an outsider looking in on another country's struggles, providing a mostly unbiased and balanced perspective and observations on things a native would take for granted. I particularly liked how he distinguished dialects by how they pronounced fokker, fekker, fooker. He provides a balanced view of the Protestant and Catholics sides and because neither side is prejudiced towards him, he can interact with both. The fact that Ferguson is Canadian is a bonus. I can easily understand a Canadian perspective and appreciate the little jokes he makes about being Canadian. Being Canadian in Europe is a lot like being Welsh in North America: no one really cares. It's not that they hold it against you. If anything, they have a vaguely positive image, a sort of benign lack of interest, as it were. "Canadian? That's terrific. "Welsh, you say? Good for you." Another reason I enjoyed this book is because it's about a subject I know (knew?) next to nothing about. Northern Ireland has always been this fuzzy patch of knowledge in my mind, where I knew it was dangerous and I think it was dangerous because some Christians were fighting. But that's all I knew. Starting the book was tricky for me because I had trouble keeping the two 'sides' straight, for example, I couldn't remember if the UVF was for Catholics or Protestants and which side was unionist or loyalist, etc. Fortunately, Ferguson provides a handy little 'binary code' of different terms and aspects starting on page 26. He does caution that obviously not all aspects of the two sides can be reduced to this pairing code, but it did help me keep up with the various terms used throughout the book. I very much enjoyed the segments on the history of Ulster. They helped give Ferguson's tale and the current conflicts greater context. I still had trouble remembering names of places. With so much travelling in such a short period of time, bouncing around through all these tiny little villages, I guess that's to be expected. It didn't really detract from my reading, though. As if all that wasn't enough for a good read, there's also a subplot of sorts that sees Ferguson seeking out some lost family history. This book is packed full of all sorts of good things and often reads as though Ferguson is sharing his story with you over a beer. If you've got any interest in Northern Ireland, humour or travel, I would definitely recommend this book.